For many business owners and property managers, presentation is a top priority for setting the tone of quality for both employees and guests. From the lobby to the conference room, every space in your building should exude professionalism. Commercial elevators serve to provide transportation for individuals in a way that is quick and convenient. You want to look the best for your guests, and having an aesthetically pleasing elevator cab is one way to optimize appearances. 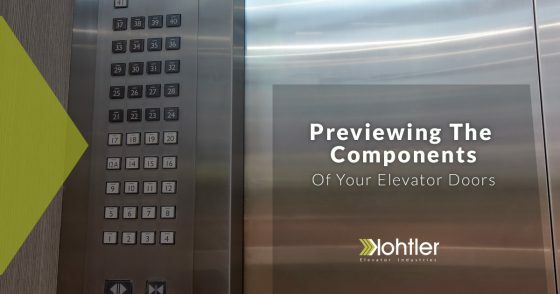 Kohtler Elevators is your source for durable and versatile elevator parts, producing high-quality products in order to provide you with personalized solutions for your building. Every part in your elevator system serves a unique purpose. Today, we’ll preview a few components involved with your elevator doors and the resulting benefits. If you’re in need of dynamic elevator interior solutions, be sure to reach out to Kohtler Elevators today! The door sensors installed in your elevator system serve to keep people and property safe. In the olden days, systems utilized photo eyes, or small light bulbs that sit at knee level to determine if the light is blocked. Modern technology relies on infrared beams that usually come with a pair of components, including a transmitter and receiver for determining if a person or object is blocking the doorway. Door sensors serve to keep the elevator doors open when something is in the threshold, improving safety and preventing damages. One convenient component involved with your elevator system is the lighting that dictates when doors are opening and closing in addition to illuminating when an elevator arrives and the direction it is traveling. While the LED lamps on the sides of elevator doors are less common now, they can still be found with certain carriers. These lights help to avoid any confusion with the direction and arrival of the elevator cab, which can prove very beneficial for buildings with high traffic levels. As always, safety is a top priority with all elevator parts. Elevators are installed with interlocks with the intention of barring individuals from opening the doorway to gain access to the shaft. Unless the cab is present, people should not be able to open your elevator doors. Once the cab arrives, an electrical circuit is completed to supply the power for opening procedures. In the event of an emergency or elevator repairs, these doors can be opened with a door key. While every manufacturer provides their unique keyhole type, the shape itself must be uniform. Modern keyholes now utilize a triangle shape for quick recognition and access. Modern elevator parts are built to meet the highest standard in order to provide the highest level of safety and reliability for buildings across the globe. Elevator doors utilize a number of components for this purpose, more than we have time to cover. If you’re in need of elevator cab or door components that are unmatched in quality, then be sure to reach out to Kohtler Elevators. Our team of professionals will work with you to provide the best outcome for your structure’s needs. Contact us today to learn more about our products!